Angry Birds is the epitome of a new era in the world of video games. A few years ago, the market for mobile games was a marginal part in the electronic entertainment industry, but with the advent of new platforms like the App Store and the emergence of the iPhone and touch terminals, the trend changed. Angry Birds was not the first game to succeed in later iOS and Android but maybe if it was the first to be a real phenomenon landings and sales, crossing the line between games and popular culture. Over the years, Rovio began pulling sequels, variations and adaptations galore, sometimes flirting with other genres that have little or nothing to do with the puzzles. Several years later, and with a huge string of titles behind, Angry Birds 2 arrives changing again the game. Angry Birds 2 is a largely conservative game that offers the same as we have seen repeatedly, but expanded, and especially refined. This second installment also draws on the new trends of monetization: Angry Birds 2 ceases to be a paid app on iOS and Android to move to free-to-play. Angry Birds 2, go ahead, is a consistent title and heir of the main characteristics that got us into this angry birds released from a giant slingshot. 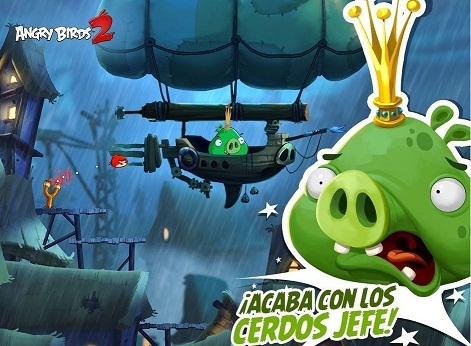 The app, free download, begins the same way many other titles in the series: teaching its gameplay remains intact Angry Birds 2 core control and always possibilities, allowing freely destroy the structures, forts and castles of the Sibylline and green pigs. Rovio knows that the great attractiveness of their games is that they were able to catch the player to the first hurdle. Its playing style, designed for touch screens although the game made the jump to other consoles and machines soon, managed to dazzle the user launches a spiral without end against the pigs, keeping it attached to the phone or tablet. That is, as expected, we will take, drag and target in order to seek the weak point of the structures. Rovio wants to keep the reason for his main series more or less intact, leaving the experiments to Angry Birds Space or cutting titles. What has changed is the structure. We used a single level, with several attempts in the form of birds. By adapting to free-to-play, Rovio has decided to change and add some complexity to its development. We now have a number of birds for each level can choose those that most interest us like a title card in question. Choose from a bird hand is a matter of taste and skills that best suit our style of play, but Angry Birds 2 will always guide us to assess the power of destruction of our squadron of birds. The special powers, before and anecdotal limited to the spin-off, makes an appearance, allowing us to pass in the blink of an eye the most complex levels and moved side-effect of the introduction of gems as base currency of the game, and talk further on. Angry Birds 2 also changes its development. If before we had a tight level, with a single slingshot, now we have to think ourselves very well the actions to take, as each phase has several rooms and buildings, and limited use of birds. Including bosses, who appear from time to time five phases-each have one and they have their own life-bar, also added extra to a game that could be too easy and repetitive after years challenge. Overtime gameplay that comes garnished with Arena mode, which has markers, challenges and own achievements. Rovio knows very well what works on their license, and has been used to adjust some aspects that seemed stalled after the passage of the years. The scenarios, for example, drink other games outside the main series, and incorporate new interactive elements, as carnivorous plants or rockets, which added additional destruction and butterfly effects to the explosive formula of app. Then they operate these developments? Yes. In essence, Angry Birds 2 game is the same, with slight changes and a structure with gems, lives, in-app purchases and own standards challenges of puzzle apps today. Unlike other games in the Angry Birds series, the difficulty seems to have decreased. We can go without eating or drinking to get very high scores, advancing rapidly in the app in a few we have five attempts or lives minutes per session, and the truth is very complicated. In a way, we believe it is another effect of the casualization of the franchise, trying to open up an even wider audience by lowering the demands of its puzzles. In these borders, we have a paradox. Is it a troublesome game as free-to-play? We think not, but it is true that incites the unwary player to use the resource of gems as a bargaining chip when using spells or the like, and therefore, to finish going through box, breaking the balance that had the original game as well studied. Angry Birds 2 has one of the best audiovisual sections of the saga perhaps the most rounded and all care, very close to the style of the animated series has been around the world. The Red, Chuck, Silver or bird Estela, to name a few-have more personality and presence, counting the scenarios and levels with a single depth in the franchise. Angry Birds 2 always has a detail, a movement, an animation or undiscovered secret in each level and puzzles that we face especially highlighting the blasts, which now literally jump to the screen. The soundtrack, which is now more lively, fast and furious, fits well with the new style and presentation of the game, which takes on an aspect of refined product. Angry Birds 2 supports Game Center on the iOS, and it has Castilian translation. Angry Birds 2 offers everything a sequel, in principle, should offer, maintaining the essence of the original and expanding it in several respects. But the problem is that Angry Birds 2 arrives, in our opinion, a little late. The second part of Angry Birds has landed on digital platforms of Apple and Google in a somewhat delayed manner, and dozens of deliveries after the guise a free-to-play, something that will appeal to many players. But if you love the series, and it enjoys or has enjoyed a number of titles that have thrilled millions of users around the globe, Angry Birds 2 provides content and more than enough elements to entertain for days.